Paleontologists in Southern Utah founded 2 new rare species of dinosaurs in this past Friday. 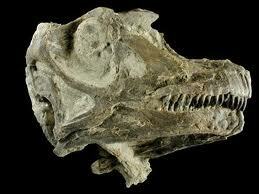 The fossils are believed to be piece of the triceratops family. Paleontologists were also found that the first dinosaur was Utahceratops, and the second dinosaur will be named Kosmoceratops.Scientist said there were a few distinctions among the two species but differences as well.Both were herbivores and contained horns on the front of their heads. The Utahceratops was the larger of the two species. For its facial features the Utahceratops had one large horn on the center of its head and two small horns on both sides. It weighed in at 3 to 4 tons, with a height of 6 feet. It stood 18 to 22 feet long and had a head length of 7 feet long. The Kosmoceratops weighed in at 2.5 tons approximately and was a height of 15 feet long. On the front of its face, pointing in a downward motion, researchers found that it contained at least 10 to 15 horns. The Kosmoceratops had an appearance like to a bison. The species is set up to be preserved and viewed at The Grand-Staircase Escalante National Monument.